Spring Break Camp in Killeen, Texas: Camp Hermione!!! Over Spring Break, the ladies of the Clements Boys and Girls Club in Killeen enjoyed exploring the magical world of Hogwarts with the help of Hermione Granger. From dissecting owl pellets and learning about chromatography to diet coke explosions and more, these ladies discovered the magic of science. Dissecting owl pellets was a huge hit with the girls. They were each able to learn how owl pellets are formed and determined their contents with tweezers and a magnify glass. Many of them found various bones of small rodents and were able to reconstruct the rat skeletons. Then the girls expanded their knowledge of nocturnal creatures with a lesson on bats and echolocation. Later in the week the girls became forensic scientists and solved a mystery using chromatography. A mysterious note at Hogwarts was found, so the girls tested the reaction of different inks with alcohol, a solvent, to determine which pen was used to write the note. Throughout the week, these ladies also participated in discussions about the importance of attending college and the various types of STEM careers they can pursue. 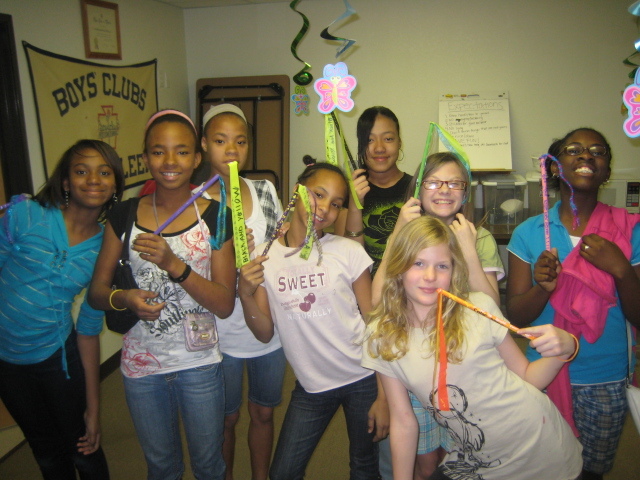 To highlight these discussions the girls made achievement bead bracelets – each bead color representing goals for their future including graduating high school, attending college and graduate school, and pursuing a STEM career. For a finale the girls learned about the process of nucleation with the legendary mixture of Diet Coke and Mentos! First the girls experimented with one Mentos, dropping it into a small bottle of Diet Coke. While that reaction was fun to watch, the girls were most impressed when we dropped a whole roll of Mentos in a 2 liter bottle of Diet Coke. This was well worth the mess. Discover the science behind Halloween mysteries! Don’t miss out on an event the whole family will enjoy. Candy, spooky science activities, costume contest, games and more.